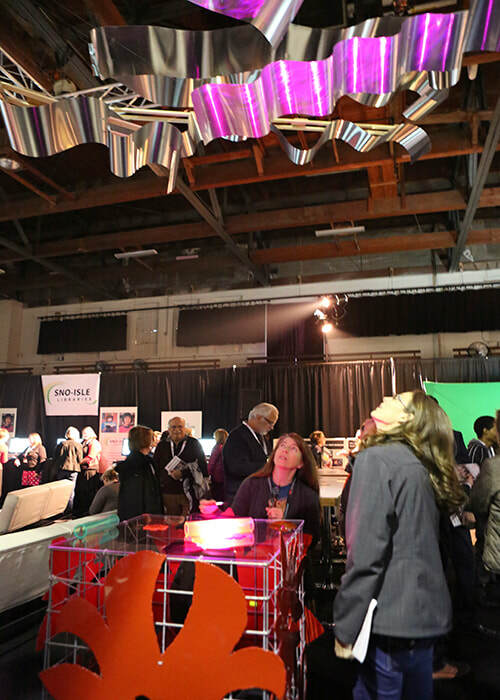 'Flower Power' was and interactive light sculpture featured in the auxiliary viewing area for the live Tedx performance in downtown Edmonds in 2016. This piece re-imagined steel flowers from an 'On the Fence' grant from an Edmonds Arts Commission installation by making the flowers into a fenced box platform used to manipulate colored plexiglass forms. The cast colored lights from these forms would interact with an intelligent computer that was also casting different lights and patterns onto a dozen metal waves suspended from the ceiling. Viewers were invited to play with the forms and see what new images they could create.